When many moderns think of the plague, the uproarious "Bring Out Your Dead" skit by Monty Python probably comes to mind. But in medieval Europe, the Second Plague Pandemic was no laughing matter: it was a particularly deadly series of disease outbreaks that began in the 14th century with the Black Death. The Black Death, which reached Europe in October of 1347, killed upwards of 30% of European populations and was responsible for far-reaching social, economic, and political consequences that likely changed the course of history. Now, in a truly fascinating multi-disciplinary study, a pan-European group of researchers has attempted to clarify several outstanding questions related to the spread of plague throughout Europe in the 14th century. In their article recently published in PNAS entitled "Integrative approach using Yersinia pestis genomes to revisit the historical landscape of plague during the Medieval Period," Amine Namouchi and colleagues use ancient DNA (aDNA) evidence corroborated with historical, archaeological, and ecological data to shed light on the origins of and epidemiology surrounding the Second Plague Pandemic. 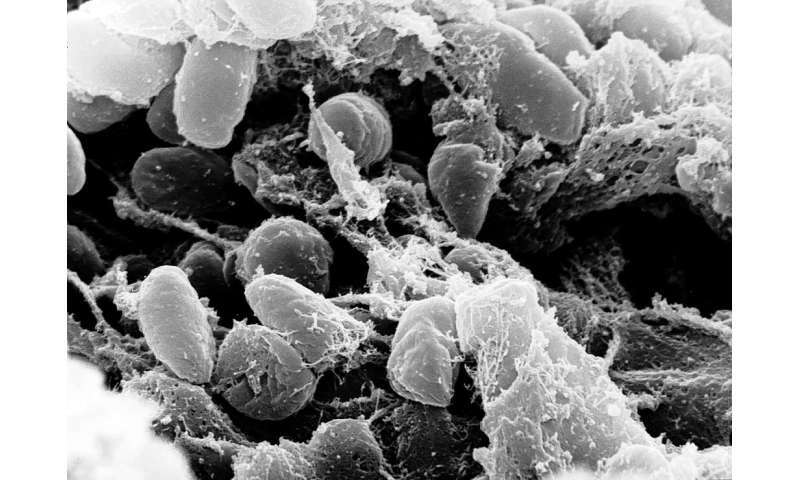 Plague, while deadly to humans, is primarily a zoonotic disease, represented in this case by the bacterium Yersinia pestis (Y. pestis. As such, plague is maintained in so-called wildlife reservoirs where it is spread mainly among rodent species by fleas, and through which it is occasionally transmitted to human populations. While plague reservoirs exist in the wild on all continents except Australia and Western Europe, it remains unclear whether or not plague reservoirs ever existed in Western Europe. If such a reservoirs did exist, their presence would support one existing hypothesis which supposes that plague, after its initial introduction at the outset of the Black Death, became endemic to the region for a time and was responsible for multiple later outbreaks in Europe, and possibly for the Third Pandemic which struck China centuries later. A competing hypothesis holds that plague originated in wildlife reservoirs in Eastern Europe or Central Asia and was spread through human movement and trade routes by which it was repeatedly introduced to various European population centers. 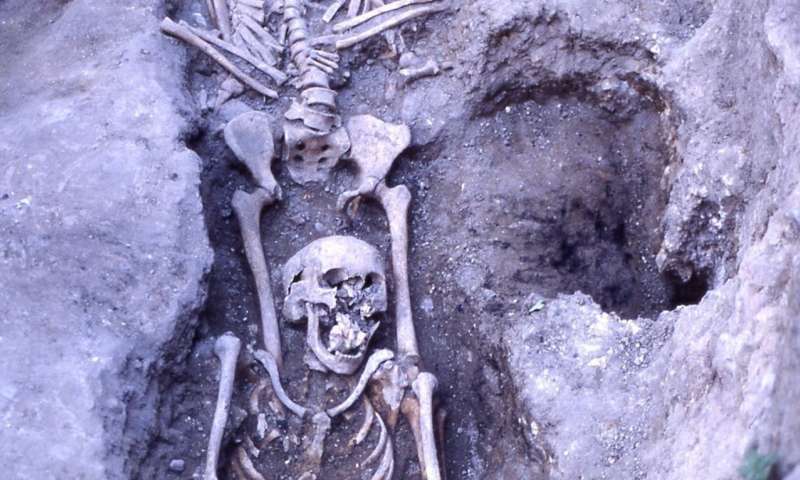 This second hypothesis rules out a Western European plague reservoir. The burial excavated at the abbey of San Salvatore. Credit: Elsa Pacciani and Luisa Quaglia. To better understand the details surrounding the timing and transmission of the Second Plague pandemic as well as the evolution of various strains of plague bacteria, the researchers collected and sequenced sections from five ancient plague genomes from four archaeological sites throughout Western Europe: The Abbadia San Salvatore in Italy; St. Laurent de la Cabrerisse in France; Bergen op Zoom in the Netherlands; and Oslo, Norway. These five genomes all date from the 14th century and constitute the focus of this study, though they have been analyzed alongside other aDNA strains from the Bronze Age, the First and Second Plague pandemics, as well data from modern plague DNA. It is important to note that the Second Plague, in relation to the aDNA samples discussed here, is generally sub-classified into two more specific historical periods: The Black Death, which represented the initial disease outbreak in Europe and lasted from approximately 1346-1353, and the pestis secunda, which represented a second wave of outbreaks from the early 1360s. By applying computational genomics methods and a variety of bioinformatics tools and systems to their data, the researchers were able to assemble a phylogenetic tree to provide both a graphical representation of the major evolutionary history of Y. pestis as well as a snapshot of each of the five newly analzyed aDNA strains in relation to other adjacent historical aDNA samples, for example, other samples from Second Plague sites in London, Barcelona, and Russia. While the phylogenetic tree forms the centerpiece of the study, archaeological, historical, and ecological evidence was also used to inform and corroborate genomic data. For example, historical records of death bed testaments from the Abbadia San Salvatore in Italy help to place the date of the plague outbreak there to a period spanning late June to early September of 1348. So how does this research shed light on either of the two aforementioned hypotheses regarding plague transmission? By examining the genetic similarity of these five newly-sequenced plague samples in relation to each other and to existing aDNA samples, and with supporting archaeological and historical evidence, the study authors were able to conclude that two Y. pestis strains (St. Laurent de la Cabrerisse, France; and Oslo, Norway) were identical to two clones from London and Barcelona from the time of the Black Death. The genetic similarity here seems to indicate a common origin for all of these strains. Introductions of plague involving different land and maritime trade routes. The two arrows starting from the region highlighted in dark color referring to the Land of Darkness, reflect the involvement of the fur trade route in the dissemination of Yersinia pestis into Europe. The blue arrow indicates the arrival of plague into Marseille in 1720 through infected ships from Sidon (Lebanon). Red circles: Black Death samples (1346-1353); Pink circles: samples from the so-called pestis secunda (1357-1366); Light Blue circle: sample from Ellwangen (1485-1627+); Blue circle: sample from Marseille (1720-1722). The black lines represent the Silk Road. Blue lines represent the maritime routes. The dashed lines represent the fur trade routes. The geographical regions highlighted in yellow correspond to natural foci of plague. Credit: Amine Namouchi. On the other hand, the Y. pestis strain recovered from Abbadia San Salvatore in Italy, with two single nucleotide polymorphisms (SNPs) in its sequence represents a more recent genetic derivate from the other Black Death samples. Historical evidence suggests this strain reached Italy via Mediterranean shipping through Pisa where it subsequently devastated the Italian countryside for a period of months before reaching the Abbadia San Salvatore in Siena. The authors suggest here that the long chain of overland transmission, possibly following a pilgrimage route, may be responsible for the additional SNPs, rather than the presence of a local reservoir or the possibility that they existed prior to arrival at Pisa. While the researchers don't entirely rule out the possibility that a stable plague reservoir existed in Western Europe—probably in the Alpine region—they find it more likely that the plague originated in areas around the Black Sea and further east. The final two Y. pestis strains gathered in their study from Bergen op Zoom in the Netherlands support this. These two strains show four additional SNPs compared with the Black Death strains previously discussed, however they are genetically very close to another, later strain from London of the pestis secunda period and a strain from the city of Bolgar in Russia. The similarity between these plague samples suggests, as does historical and archaeological evidence, that plague was spread between these geographically distinct areas via a fur trading route that linked Russian cities such as Bolgar, Novgorod and others to Western Europe (via the Baltic ports of the Hanseatic League) as well as to ports on the Black Sea, with further contact with the Mediterranean. Interestingly, this trading network was known to be sourcing fur from the "Land of Darkness," as it was then known: the West Ural region of present day Russia extending to the Caspian Sea, which is even today a known plague reservoir. The researchers go so far as to suggest that Black Death plague may have even originated with this reservoir, citing evidence from an Arab historian at Aleppo who himself died of plague in 1349. The historian noted that merchants from Crimea identified the "Land of Darkness" as the source of the original plague, which had been ongoing for 15 years there before spreading west. Ultimately, the study authors find that the balance of evidence suggests multiple successive and repeated introductions of plague to Western Europe via trade routes rather than the existence of a Western European plague reservoir. They conclude, "All things considered, the hypothesis that Y. pestis reached Europe through multiple introductions during the Middle Ages through different routes, including the fur trade, appears very plausible, at least during the Second Plague Pandemic"